Your freshman year of college can be one of the most confusing times in your life. You’ve moved away from home. You don’t know anyone. You have no idea what you’re doing. It’s like a bad scene from a movie. Well, no fear, I’ve got you covered. Lucky for you, I’ve literally grown up on a college campus. I even took my first steps at a college basketball game. I’ve been going to class with my mom, the college professor, since I was still in the womb. The best advice my mom ever gave me was that you’re stronger than you may think. I know that college can be a plethora of unknowns, so I hope these “Top 10 Tips for College Freshman from the Daughter of a College Professor,” can make it a little easier. Now, I know this quite literally may seem like a “novel” concept (pun intended), but hear me out here. You would be amazed at the amount of material on my mom’s homework, quizzes, and exams that come STRAIGHT out of the book. It’s almost like cheating if you buy one. You’ll also seem super smart to your professor in comparison to your peers who don’t even know what the title of the book is. Additional life hack: check Amazon, Chegg, and the bookstore to find the best deal on your texts. Trust me, that it’ll be worth it in the long run, guaranteed! It may seem pretty tempting to come to college and just attend class and then go home every day, especially if you don’t live on campus. But, some of the most fun happens outside of the classroom! If you were, or weren’t, super involved in high school, now’s the perfect time! Getting involved in an on-campus job, club, Greek life, or a sport is a sure-fire way to make sure you’re getting the most out of your college time. It’s basically getting friends for free. Plus, a lot of professors, like my mom, oversee these groups, so you can schmooze up to them outside of class! It’s honestly not as scary as it may seem. Feel free to stop by and say hello to your professors any time their doors are open. You can ask for clarification on an upcoming assignment or talk about your grade (asking what you can do to improve it) or ask about their research if they do it! Professors will remember you if you go to their office hours! My mom loves when students come and visit her. It can’t hurt! They may even start to like you. You get this random stapled packet of paper of the first day of class. “What is this?” you may ask. This is the key to your future class success; that’s what it is. The syllabus has everything you would ever want to know about the course wrapped up inside a few white sheets. Learning objectives, book information, professor contact information, class schedule, and a grading scale are all typically included. Study these pages; they are your best friends. Plus, there’s nothing a professor hates more than being asked a question that was clearly stated on the syllabus they took long hours to create. One of my mom’s pet peeves, no doubt! This may be obvious, but it’s not. College will happen. You don’t have someone waking you up every day or putting you on the bus to go to school. It’s up to you to walk or drive to class. This is absolutely terrifying. It would be so much easier to lay in bed all day, wouldn’t it? NO! The simplest way to ensure you’re pretty much going to succeed in most courses is to just go to class. A lot of professors, like my mom, even give you points just for going! Yay! Free points! Professors say some pretty important stuff in those classes, so I’ve heard. I know you’ve probably heard this a time or two, but there are no stupid questions (unless the answer can be found on the syllabus). Chances are, the question you have is in the head of about 10 other students who are just too afraid to say so. My mom sometimes has to answer the same question five times in a row, so make sure you’re paying attention. Being as clear as crystal on something is much better than being as clear as mud. If you are too scared to ask a question in class, tutoring is a great vessel where you can get the help you need. One important thing I learned coming to college was that going to tutoring doesn’t make you dumb; it makes you smart! It’s my mom’s worst nightmare when she hears of a student just sitting at home all summer doing nothing. Don’t get me wrong, you can still have plenty of time to lay by the pool or go on family vacation, but it’s important to not waste these precious months while you have them. Do something! Potential employers later will notice how you spent your summers. Try to get a job or internship that’s somehow relevant to the field you want to go into. You can also spend some time volunteering. Another great alternative is to conduct research. It can be extremely rewarding, and it’ll make you a stand out for grad school or a job! The research I’ve done in the past helped me get the amazing internship I have now. Public speaking is the single most important course of your college career (according to my mom). Most students are petrified of taking public speaking. They can think of nothing worse in the whole wide world. My mom is one of the lucky professors who teaches public speaking. The worst mistake you can make is to put off taking the class until the last semester before you graduate. Take it the first semester you can! It isn’t nearly as awful as it may seem, and you can apply the skills you learn to presentations that you’ll have to make in other classes. Freshman year may seem like too early to create a resume, but it’s not. My mom teaches a class to seniors where they have to make a resume, so why not get a head start now? Resumes are those things that just don’t go away. In the back of your mind, you should always think of more items that you could add to it (going back to getting involved and not wasting your summer). Each line gets you one step closer to landing your dream job one day! You can translate all the stuff on your resume directly to a LinkedIn profile. You can make connections, look for jobs, and be recruited on LinkedIn. It’s super user friendly, and it’s the future of the job market. You can make connections with students in your classes and professors you have. Build your network today! What’s ooey, gooey, chocolatey, and nutty all in one? None other than Kentucky’s original Derby-Pie®! Race to get a piece today! The Kentucky Derby is an internationally-renown horse race that takes place in Louisville. This year, the event will take place on May 6 for the 143rd running of the Derby. The Kentucky Derby features a number of festivities that take place that weekend. Among the famous event traditions surrounding the Derby is the Royal Court. The Court is a group of six women that are selected to preside over numerous Derby events. Celebrations and events are both a part of the Kentucky Derby tradition. Over the years, many different traditions have developed around the Kentucky Derby. One of the most famous of these is the Derby-Pie®. The Foodies visited Kern’s Kitchen, where the Derby delicacy is prepared, baked, and shipped all of the country. Many people may not know that Derby-Pie® is a trademark name that was born more than a half century ago of the Melrose Inn, in Prospect, Ky. George Kern, manager of the restaurant, developed the Derby-Pie® recipe with the help of his parents, Walter and Leaudra. They spent many hours trying to find the unique secret blend of chocolate and nut that make up this classic dessert. The Melrose Inn served hungry travelers for more than 50 years before closing in 2000. But, the blend remains the same, still a secret, to this day. The family, unsure what to name the pie, wrote out on slips of paper and tossed them into a hat… Derby-Pie® won and the rest was history! The Kern grandchildren now take the same pride in preparing Derby-Pie® products today that their grandparents did more than five decades ago. Alan Rupp is the current President of Kern’s Kitchen. The grandson of Walter and Leaudra Kern, Alan was the primary reason they settled in Kentucky. Walter and Leaudra had intended to move to Florida after having their fill of Pennsylvania winters and stopped temporarily in Louisville to visit and help out with baby Alan. The area worked its magic—and then Derby-Pie® came along. The Kerns stayed. Consequently, Alan grew up with the smell of pie in his nose and hints of chocolate in his veins. In 1973, he started working in the family business learning how to properly sort walnuts, crack eggs, and pour without spilling. Alan is always generous with a smile and a handshake. His son, Jon Rupp, also works for the family business as the Sales Manager. At Kern’s Kitchen, all of the magic of creating the Derby-Pie® filling is done behind the veil of a mysterious curtain. You can count on one hand the number of people who know the secret recipe. The company uses the name in the form “DERBY-PIE®” in official literature and advertisements. Kern’s Kitchen diligently guards the trademark and has filed more than 25 lawsuits to protect it over the years. The makers of similar pies have had to use different names such as “Pegasus Pie,” a reference to the Pegasus Parade at the Kentucky Derby Festival and May Day Pie, in reference to the First Saturday in May, the day of the Kentucky Derby. You can find Derby-Pie® products at many fine restaurants and specialty stores in the Louisville area, or you can have it delivered to your door. Local restaurants such as Bistro 301, Captains Quarters Riverside Grille, and Dish on Market, offer it on their menu. Each restaurant typically finds their own distinct way of presenting the classic dessert. Whether it be served as a warm, gooey treat with coffee or presented with a chef’s signature flair, Derby-Pie® is a sweet ending to your meal. Just remember-if you’ve never eaten Kern’s Kitchen chocolate-nut pie, you’ve never eaten Derby-Pie®! However, it just wouldn’t be fair to not mention all of the other delicious and classic Derby desserts. Along with Derby-Pie®, there are a couple other traditional treats that people like to serve up for Derby time. The Red Velvet Buttercream Rose Cake is a favorite for the Run of the Roses, and Chess pie is an old Southern classic that has withstood the test of time. There’s even such a thing now as Mint Julep Bars, which is a famous Derby cocktail transformed into a decadent dessert. Derby-Pie® is undoubtedly the most famous and most popular, but the honorable mentions are worth a try as well. The Foodies were treated to taste tests of the Derby-Pie® fresh from the oven, and it was enough to get us all into the Derby spirit. Easter is less than a week away, and that got me thinking. One of our Easter traditions at home is to watch “The Ten Commandments.” When in college, there are also certain guidelines we students should follow to survive this crazy time in our lives. I give you “The 10 Commandments for College Students”! Life will go a whole lot easier if you don’t question what they tell you to do… and ALWAYS read the syllabus. 2. Thou shalt not use a source in a paper without properly citing it. Plagiarism will get you kicked out of school, so don’t try it. APA, MLA, Chicago – so many styles, so little time. Thou shall purchase expensive textbooks you will never use. Use the book as a door stop instead of a reference. We’ve all been there. At least, you will probably get $4.95 in book buy-back at the end of the semester. Never getting enough sleep is basically a given when in college. There’s always something you should be doing rather than sleeping. Thou shall wait until the night before to study for an exam. So many regrets. But, for some reason, we all keep trying it. Maybe we like living on the edge. Maybe we like failing. Procrastination is a college sport. Thou shalt not covet thy neighbor’s GPA. There’s no reason to want something you aren’t willing to work hard to achieve. Raise your own GPA instead of worrying about others’. Thou shall survive on caffeine and pizza alone. Coffee is a way of life. And, when you go to UofL, like me, it’s Papa Johns. All day. Every day. Thou bank account shall always be overdrawn. It’s a good day when you check your bank account and you think you have $1.00 and you really have $3.00! Thou shall worship the teams of your college and have no other teams before them. Every t-shirt in your closet probably has your school’s insignia plastered on the front in big bold school colors. For my friends and me, it’s red and black all the way! Go Cards! You know, they never prosper. It’s the most wonderful time of year… and I’m not talking about Christmas… I’m talking about baseball season! America’s pastime strikes a special feeling in the hearts of Americans across the country, including my own. 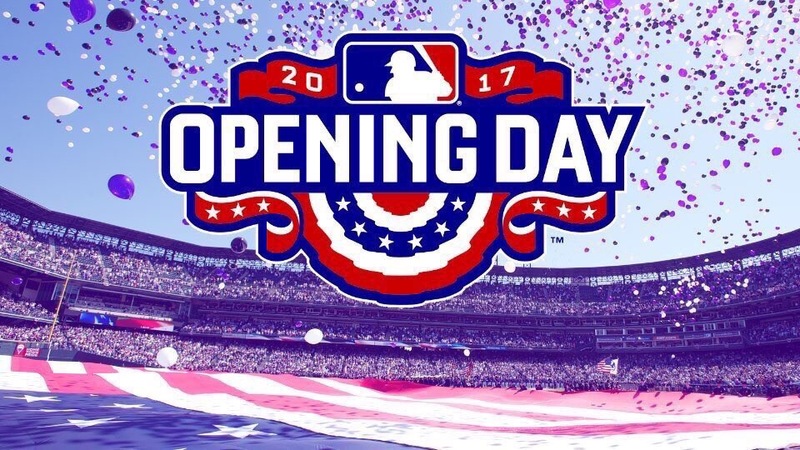 Opening Day 2017 started yesterday, April 2, with three games and continues today with 12 games. Without a doubt, my family would be put in the category as Cincinnati Reds “superfans.” After all, the Reds organization is the oldest professional baseball team, so why not root for the first? I’ve been going to Reds games for as long as I can remember. Here are some old pictures of me at Great American Ballpark. My mom and I go to at least one game a year and listen to the rest of the games religiously on the radio. Marty Brennaman is our eyes and ears onto the field, no matter how near or far they’re playing; it’s almost as if we are in on the action ourselves. Growing up a Cincinnati Reds fan, the ball park has always been one of my favorite places. There’s nothing quite like the feeling you get after you stand in line anxiously waiting to get in the stadium, and then finally making it in the door. Once you’re inside, you are immediately struck with sensory overload. You see and weave through crowds of people, painted in your team’s colors just like you (we are better off “RED”). You smell the freshly grilled hot dogs and salty peanuts. You feel a sense of excitement that you just quite can’t put your finger on. You finally get to your seat. No matter the weather, or how uncomfortable your plastic chair may be in theory, you can’t help but ignore it all and smile when you look out onto the vibrant green field to see your favorite players warming up. After what seems like an eternity of waiting, the first pitch finally sails across the plate. You hear the crack of the bat. What follows is a dynamic struggle between two teams… and one comes out the victor. Some may think baseball is boring, but I think the exact opposite. Watching a baseball game is a magical, unforgettable experience. This past weekend, I was excited to see my glorious Reds take the field for the first time this season in an exhibition game versus Louisville’s own Bats, the Reds minor league team. The two teams ended up tying, of course, because really, they are all Reds at heart. I loved getting to see two of my favorite players, Joey Votto and Billy Hamilton. I actually had the pleasure of meeting Billy Hamilton when he was still just a young Bat. Now he’s in the Major League and stealing bases like a pro! Opening Day is a magical time, a time when the promises of a new season full of homeruns, strikeouts, stolen bases, and amazing catches seem sure to end in a World Series victory. Baseball means summer will soon be here. Get to the ballpark. It’s time to play ball! Are You Ready to Escape? Do you like mystery? Or, a good brain teaser? Work well under pressure? Looking for a physical and mental challenge? We all have a competitive side, and who doesn’t like to win? Grab some friends and hit one of the newest entertainment crazes… escape games. If you haven’t seen or been to one of the escape games, they are basically rooms where you pit your wits against the riddles of the room and try to escape in an hour. They teach teamwork, problem-solving, and creativity. If you’ve dreamed of intrigue and thrilling adventures, then this game is right for you. Escape games have been popping up all over the country and Kentucky. Here’s a link to the top 10 escape rooms in Kentucky. And for my Louisvillians here’s a link to the top 5 escape rooms in Louisville. My first escape experience was at The Escape Game at the Island in Pigeon Forge, TN. I escaped a room called “Gold Rush.” The description reads: “For nearly two centuries, the hope of gold has lured people to the hills of Northern California. No one was captivated more than Clyde Hamilton, a greedy gold prospector who loved to gamble. Clyde made too many bets with the wrong crowd and now he’s missing. You’ve been tipped off to where he stashed his gold…But so has the mob. Finders keepers.” My mom, my best friend, and I successfully escaped by collecting all the gold just in the nick of time. The game included three rooms that truly brought the outdoors indoor. It felt as if we were on a movie set with realistic trees, shrubbery, and props. The realness of the set added a lot to the enjoyment. We had such a great time, we also escaped an Egyptian themed game called The Tomb in Pigeon Forge. There, we had a guide follow us as we descended into a tomb and used our flashlights to hunt clues – until the lights went out, and we had to solve the puzzle to reach the next step on our journey. We were hooked. We are officially escape junkies. I escaped an Atlantis-themed room in Myrtle Beach, and most recently a submarine-themed room in my own hometown of Pikeville, KY! “The Deep,” part of the Epic Escape Game, allowed my team to save humanity by launching a nuclear weapon successfully to repair Mariana’s Trench. Pikeville’s game also has rooms that focus on the history of our town with “The Feud” and “Buried Alive” (based on the true story of Octavia Hatcher). I can’t wait to go back! Escape centers have multiple rooms from which to choose with varying themes and levels of difficulty. To escape – choose your team wisely. Ask friends and family to accompany you that you can get along with and that complement your own skills. Listen to others. No one has all the answers. Use your team members to your advantage. Brainstorm. Everyone should contribute and talk out loud because one person might trigger someone else to discover a solution. Pay attention. Be observant. Look everywhere for clues. You never know when something small will end up being a big key to your escape. The next time you’re looking for something different to get into on a Saturday night, get ready to escape. Miranda Lambert sings, “Everybody dies famous in a small town.” Being home this week for spring break reminded me of some things that make my small hometown charming in its own special way. Here’s my “10 Ways to Know You Grew Up in a Small Town”! If it’s not at Walmart, you don’t need it… and sometimes you go just for the fun of it (and you know you’ll run into at least three people you know when you go). A trip to Wally World always makes the day special. Friday night sporting events are mandatory, even if you don’t like sports. Everyone in town will be in the stands at football games in the fall and basketball games in the winter. Go, team! When the festival comes to town, it’s everyone’s favorite time of year. In my hometown of Pikeville, KY, we have the annual Hillbilly Days festival. The small town transforms with thousands of out-of-town visitors and hundreds of vendors to celebrate our heritage while we support the Shriners. Nothing beats eating a funnel cake while you stand in line to ride the Gravitron! The fanciest dinner you can get is a hot dog and a shake at the local dairy bar. My home town favorite is Dorsie’s Dairy Bar. Yum! You can’t get away with anything because everyone knows your mom. So, I learned quickly not to even try it. You’re forced to pool through your best friend’s exes for date options because there aren’t enough decent men in your town… and at least that’s better than dating your cousin. Everyone has one of three last names. In my small town, everyone seems to be a Justice, Thacker, or McCoy (and they’re the real McCoy). Family reunions are basically a whole county-wide celebration. Who needs a movie when you can four-wheel up a mountain and stare at the stars? If you’re broken down on the side of the road, there will always be someone willing to help you get where you’re going. Someone who knows you will probably stop, but in a small town, people who don’t even know you jump to lend a hand. They say everything you need to know you learn in kindergarten. In a small town, you make forever friends when you’re only 5 years old. You rely on them while you grow up and become your own person. I met my BFF when I was only 4, and I know she will always be there for me when I need her, even if we don’t go to the same school. It’s kind of a bummer that the nearest mall is about 2 hours away from my hometown. When people ask where I’m from, I have to pull out a map to show them. These things are just fine by me because you can take the girl out of the mountains, but you can’t take the mountains out of the girl. If you see me today, I’ll be showing off my third Maroon 5 concert shirt. My first Maroon 5 experience was a concert at the stunning Mandalay Bay in Las Vegas. That was all the way back in 2013. It was a Christmas gift from my uncle, and my fascination with one of the hottest pop bands today was solidified. Then, again in 2015 I got to see Adam Levine and the crew jam out in Louisville’s own KFC Yum! Center. I remember being excited to come to the town that I knew would be my home someday. Our tickets were closer to the stage in Louisville, and I got some up-close looks at Adam. Another two years later, in 2017, I found myself listening to my favorite band for “one more night” in Cincinnati this weekend in what was the best of the three Maroon 5 concerts I’ve had the pleasure of seeing. They paid tribute to three pop icons who have recently passed. Adam came out wearing a George Michael inspired look complete with 5 o’ clock shadow, leather jacket, and ripped jeans. They played an instrumental tribute to Bowie, and for the grand finale, they swathed Bank One Arena in purple as they rocked Prince’s “Let’s Go Crazy!” This was especially interesting for me since my mom was at the concert with me, and that was a song she listened to when she was in college. Of course, Adam sang everyone’s favorite “She Will Be Loved” to make for a memorable end to the night. All in all, it was quite an incredible show! Now, I need to find a pay phone so I can spend all my money on some sugar! I can’t wait until two more years have passed because I’m sure to see Adam another time by 2019. Ultimately, I hope to go to a fifth V concert to collect another t-shirt.